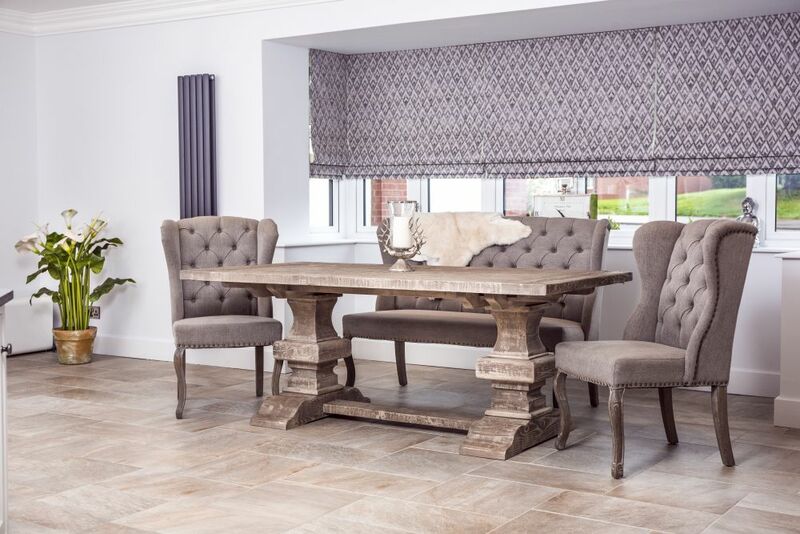 Dining tables are often the heart of the home, as all life revolves around it; eating, socialising, homework, occasions. Not only this, but a dining table plays a big role in the look and style of your kitchen or dining room. That’s why choosing one is not a decision to be taken lightly. Chances are, your table will be around for years to come. You will want it to grow with your family’s changing needs, and you want to grow to love it for all of the memories that it holds, not opt to replace it in a short time. What do you use your dining table for? We all lead busy lives, and sitting at the dining table as a family can be a treat reserved for Sunday dinners and special occasions. If you’re more prone to eating on the go or in front of the tv, but still host Christmases, then consider an extending leaf table. This affords you the room space when you aren’t hosting, but also the ability to seat more people at the table when you need to. A tip would be to buy enough chairs to fit around your table when it’s extended, and use them in other rooms around the house when they’re not needed at the table. That way, you won’t have mis-matched chairs when the table is extended, and if you moved to a larger property that could accommodate the extended table, then you won’t have to replace a set of dining chairs. A common mistake is forgetting to factor seating into the equation when measuring up for a new dining table. In order to comfortably walk around the dining table, push chairs back to get up from the table, and also have enough seating room, you should allow 3ft of clearance space from the back of the chair (when it’s pushed in). You also need to consider the size of your chairs. Large dining chairs, such as carver chairs at the heads of the table, will require more space. For guests to be comfortable and not cramped, they need at least 60cm of space at the table, although 80cm is preferable if you have the room. Consider the size and shape of your room. If you’re a little pushed for space, then a round table may be the best approach. Round tables work for everyday dining; it’s an intimate setting that allows everyone to see and hear each other. They have a smaller footprint than rectangular tables, and often have a pedestal base, which stop the chairs from looking cluttered. If you have a particularly small or dark room, then a round glass dining table will give your space a more open and airy feel. The base of the table is more important than you might think. Tables usually have one of three types of base: four legs, a pedestal, or a trestle base. Legs or a pedestal base allow you sit people on the end of the table, whilst that may be more difficult with a trestle base. 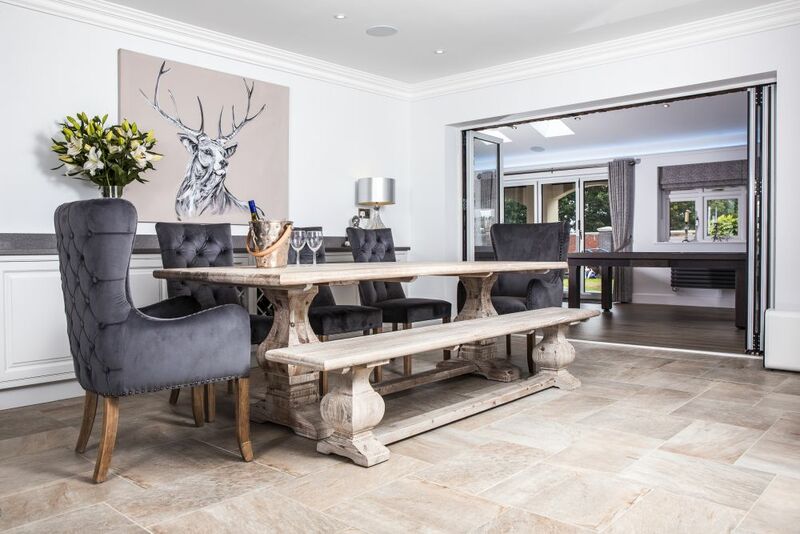 However, if you choose an X-frame or A-frame dining table from our Design Your Own Table range, we can make a bespoke table top with enough overhang to fit chairs at the heads of the table, without losing the impact of a statement table base. If you’re feeling bold, why not go for a poseur table? A poseur bar table has a standard height of 110cm and makes for a fantastic quirky feature! By opting for backless stools to go with your table, you can tuck them under and afford yourself that extra bit of room space when the table isn’t in use; choose stools with backs for added WOW-factor. We offer plenty of poseur bar table options in our Design Your Own Table range, including a huge variety of top and bases to choose from. Browse our website to see our extensive range of dining and poseur tables. 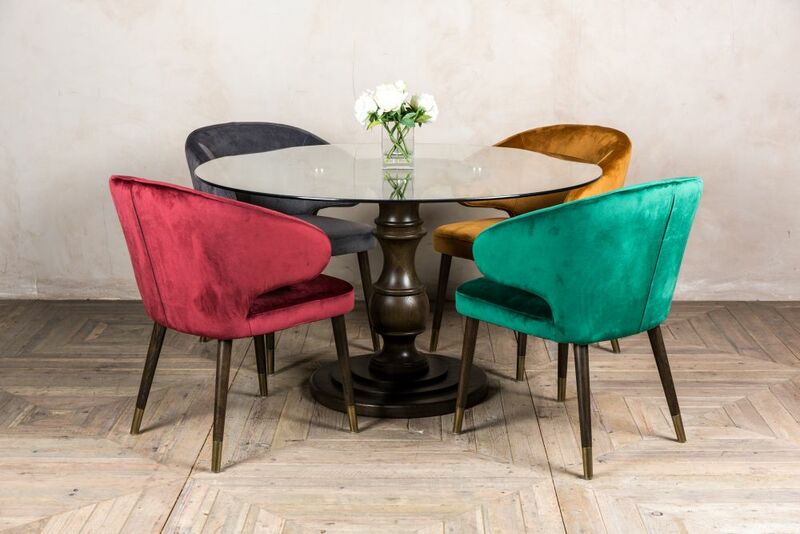 We have a large collection of rustic, industrial style, traditional and modern dining tables to choose from, and plenty of stunning dining chairs to style with them. Our experienced sales team will be more than happy to offer help and advice, too. Simply email sales@peppermillinteriors.com or call us on 01543 375872.